More than 14,000 civilians now serve in UN peacekeeping operations around the world. As peacekeeping operations have become more multi-dimensional, the need for specialized civilian skills is ever in demand. Civilian staff members perform many of the mandated tasks of peacekeeping operations: promoting and protecting human rights, helping strengthen the rule of law, fostering political and reconciliations processes, promoting mine-awareness, and serving as public information officers who explain and build support for the peace processes and the work of the UN. Civilians also serve in many support capacities in the areas of finance, logistics, communication and technology (ICT), human resources and general administration to help missions promote peace and security. Civilians serve as either international staff or as national staff hailing from the host country, but also as UN Volunteers, consultants or contractors. It is an operational imperative that we recruit and retain female peacekeepers to achieve gender equality. Gender equality contributes to lasting peace as women and men experience, engage in and are affected by violent conflict differently which causes different understandings of peace. 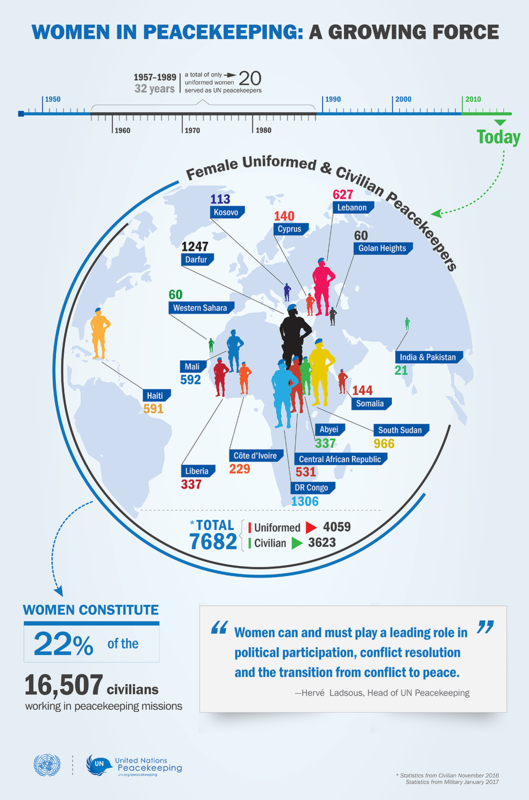 Increasing the number of women peacekeepers will encourage women from the countries we operate in to participate in public life and help dismantle harmful stereotypes and assumptions that impede women’s ability to play a central role in public life, including in peace-building processes. UN Peacekeeping advocates for the deployment of more women. Security Council Resolution (SCR) 1325 on Women, Peace and Security was a landmark resolution that addressed, for the first time, the disproportionate and unique impact of armed conflict on women. It recognized the under-valued and under-utilized contributions women make to conflict prevention, peacekeeping, conflict resolution and peacebuilding. UN Peacekeeping has used SCR 1325 and additional resolutions to implement the Women, Peace and Security agenda and increase the number of women peacekeepers. The Secretary-General launched a Gender Parity strategy in 2017 to reach gender parity among senior UN leaders by 2021 and across the UN system by 2028. This strategy sets the tone and guidance for efforts to increase numbers of women in civilian and uniformed roles in peacekeeping. Gender parity and diversity in leadership teams brings important perspectives and enables missions to engage a broader section of the population. It is imperative that UN Peacekeeping recruits and retains women peacekeepers who have made a positive impact on peacekeeping environments, both in supporting the role of women in building peace and protecting women’s rights.